The Collarum ACO Special contains everything needed for capturing that "hard-to-catch" domestic dog including bait. This is a complete kit, right out of the box, nothing else necessary for capturing canines. Includes instructional DVD. The Collarum® is one of the best and most humane canine capture devices on the market. The Collarum® throws a secure, non-choking cable loop over a canine's head and around the neck making capture faster, easier and more effective than ever before. Triggering requiries a "bite & pull" action, which makes the Collarum® canine specific. It won't be set off by other wildlife. Unlike other canine capture devices, Collarum® delivers three major advantages. 100% Canine Specific - the trigger uses a "bite and pull" action (similar to the proven M-44 cyanide gun action), not a"push or depress" mechanism employed by conventional traps. Proven Humane Method - From day one, the Collarum® was designed to meet U.S. and International Humane Standards. Through testing in conjuction with the USDA's National Wildlife Research Center, improvements were made, including the Relaxalock cable that ensures even more "dog-friendly" captures. Ideal for All Areas - Light, compact and easy to hide, the Collarum® poses little risk to humans, livestock and pets - a particular advantage for Professionals in high traffic and high visibility areas. Over the past 10 years, the Collarum® has been proven in urban backyards and landfills, coyote-plagued pastures and remote rural settings worldwide. There is a worldwide demand for more humane devices to capture animals, both fur bearers and predators. This demand arises for both environmental and ethical reasons. An Agreement on International Humane Trapping Standards signed in 1995 by the European Economic Community, Canada, and Russia may ultimately lead to the banning of all steel leghold traps in those countries. Already some states in the U. S. (e.g., California, Colorado, Washington, Massachusetts, Florida, and New Jersey) ban these traps. Testing and development has been taking place for several years in conjunction with the National Wildlife Research Center of the USDA's Wildlife Services division. First, it is canine-specific because of the trigger mechanism. The trigger requires a pull action rather than the push/depress mechanism normally employed by traps. The effectiveness of this action for canine specificity has been proven through the years by the M-44 cyanide gun, which uses a similar trigger principle. The only animals caught by the Collarum™ have been canines. The trigger and spring-loaded action distinguish the Collarum™ from other devices which can be very indiscriminate in what they capture. 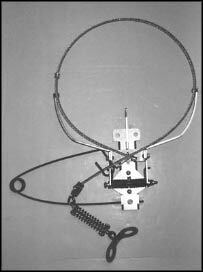 Second, the Collarum™ is much more humane than existing traps. In a study conducted by the Predator Research division of the National Wildlife Research Center, Dept. of Agriculture, (Texas, Feb. 1999), 70% of coyotes caught showed no significant injuries, while the most prevalent damage was to the teeth in approximately 1 of every 5 animals. Most dogs and fox sustain substantially less damage because they fight less than coyotes. The recent development of the Relaxalock™ cable assures an even more "dog-friendly" capture. Third, this trap is much safer to utilize in areas where people, pets and other domestic animals may come in contact with it. An unknowing human springing the Collarum™ is at little risk. Animals other than canines are very unlikely to be caught by this device even if they spring it, and captured domestic dogs can be released with no harm done. Unlike cage traps which are large, bulky, and difficult to conceal, the Collarum™ is light, compact, and easy to hide. This gives it distinct advantages for Animal Control Officers (ACOs) in high visibility areas. The Collarum™ has also proven its effectiveness in capturing animals that won't approach a cage trap or tolerate the close approach of humans. As one Wildlife Control Officer in Wyoming puts it, "In the course of catching feral dogs, fox and coyotes, I have found the Collarum™ traps to be a viable option for lethal and non-lethal control of problem canids where other control devices could not be used." Besides catching canines in remote settings, ACOs have caught coyotes in the backyards and gardens of urban residents, feral dogs at landfills, and coyotes and fox in pastures with livestock present. Gary Beeman of Lafayette, CA reports, "I put the Collarum™ out the first weekend I got it. In three days I caught two feral dogs that local Animal Control Officers had been after for two years. They'd run out of options. I look forward to using it again in similar circumstances." Recently an ACO in Louisiana reported setting his Collarum 12 times and capturing 11 dogs. Extensively field tested at the National Wildlife Research Center in Denver. ShopTJB is pleased to be offering this product as it is the latest technology development in live-capture cable restraint systems. Can be configured for lethal capture upon request. Each order includes a "how to" DVD depicting setting, bedding, location, and helpful tips.